Di origini lituane, Massimiliano Fuksas nasce a Roma nel 1944. Consegue la laurea in Architettura presso l’Università “La Sapienza” di Roma nel 1969. E' tra i principali protagonisti della scena architettonica contemporanea sin dagli anni '80. E’ stato Visiting Professor presso numerose università, tra le quali: la Columbia University di New York, l'École Spéciale d'Architecture di Parigi, la Akademie der Bildenden Künste di Vienna, la Staatliche Akademie der Bildenden Künste di Stoccarda. Dal 1998 al 2000 è stato Direttore della “VII Mostra Internazionale di Architettura di Venezia”: “Less Aesthetics, More Ethics”. Dal 2000 è autore della rubrica di architettura fondata da Bruno Zevi, del settimanale italiano “L'Espresso”. Dall'inizio del 2014 è, insieme alla moglie Doriana O. Mandrelli, autore della rubrica di Design del quotidiano italiano "La Repubblica". Da molti anni Fuksas è attento allo studio dei problemi urbani nelle grandi aree metropolitane ed è costantemente alla ricerca di nuovi materiali, di nuove tecniche di realizzazione senza mai tralasciare il contesto in cui l'opera si inserisce e riservando particolare attenzione allo sviluppo sostenibile. Il modo di progettare di Massimiliano Fuksas si sviluppa attraverso un intenso processo che evolve da una serie di modelli tridimensionali trasferiti poi in bidimensionale ed infine realizzati. La sua creatività si manifesta in un' architettura lontana dalle geometrie classiche, tende sempre verso il superamento della forma, giungendo a risultati con effetti innovativi. Qualsiasi oggetto deve riuscire a raccontare una storia. Facendo parlare le sue opere e la sua carriera, lo scopriamo un intelligente e provocatorio visionario, ma anche un artista a trecentosessanta gradi, capace di coniugare la propria sensibilità alle diverse esigenze costruttive. L'eclettismo artistico di Massimiliano Fuksas trova espressione anche nel campo del design con la realizzazione degli interni di numerosi progetti e la creazione di oggetti di arredamento, originali nello stile e nei materiali. "L'importanza dell'architettura è tutto ciò che c'è dietro ad un progetto, la magia senza la quale un'opera si impoverisce. Non conta il materiale con cui è costituito l'oggetto, ma la suggestione che l'oggetto stesso riesce ad emanare. Questo per me è l'architettura, e tante altre cose ancora..."
l’AIA -American Institute of Architects- Washington D.C., USA. Ha inoltre vinto numerosi premi tra i quali: “Certificazione LEED EB:O&M” al Nuovo Polo Fiera Milano, primo polo fieristico europeo sostenibile, Milano, Italia; “Architizer A+ Award” e “Architizer A+ Popular Choice Award”, Shenzhen Bao’an International Airport – T3, Shenzhen, Cina premiato nella categoria “Trasporti – Aeroporti”, New York, USA; “Idea-Tops Awards”, Shenzhen Bao’an International Airport – T3, Shenzhen, Cina premiato come “Best Transportation Space”, Shenzhen, Cina; “Medaglia della Presidenza del Consiglio dei Ministri”, Italia; “International Architecture Awards 2007”, Nuovo Polo Fiera di Rho-Pero, Milano, Italia premiato “Best New Global Design”, Chicago, USA; “Grand Prix National d'Architecture Française”, Parigi, Francia; premio alla carriera “Vitruvio International a la Trayectoria”, Buenos Aires, Argentina. 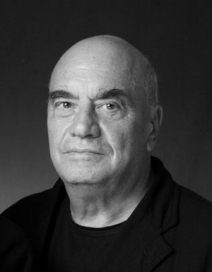 Of Lithuanian origin, Massimiliano Fuksas was born in Rome in 1944. He graduated in Architecture at the University "La Sapienza" in 1969. He is one of the main protagonists of the contemporary architectural scene since the 80's. He has been a visiting professor at several universities, including: Columbia University in New York, École Spéciale d'Architecture in Paris, Akademie der Bildenden Künste in Wien, Staatliche Akademie der Bildenden Künste in Stuttgart. From 1998 to 2000 he was Director of the “VII Mostra Internazionale di Architettura di Venezia”: "Less Aesthetics, More Ethics". Since 2000 he is the author of the column dedicated to architecture founded by Bruno Zevi on the Italian weekly publication "L'Espresso". Since the beginning of 2014, he is -together with his wife Doriana O. Mandrelli- the author of the design column of the Italian newspaper "La Repubblica". For many years Fuksas devoted his attention to the study of urban problems in large metropolitan areas and is constantly looking for new materials, new construction techniques without neglecting the context in which the work is part and paying particular attention to sustainable development. The way to design Massimiliano Fuksas is developed through an intensive process that evolves from a series of 3D models then transferred in 2D and finally realized. His creativity has been manifested by an architecture far from classical geometries, always tending towards overcoming shape, achieving results with innovative effects. Any object must be able to tell a story. Let his work and his career speaking for him, we discover an intelligent and provocative visionary, but also a 360 degrees’ artist, who combines his sensitivity to the different construction needs. The artistic eclecticism of Massimiliano Fuksas is also reflected by his interior design’works for many projects and by the creation of home furnishings, original for style and for the use of materials. "The importance of the architecture is all that is behind a project, a work is impoverished without this magic. It is not important the material which is made up of the object, but the suggestion that the object itself radiates. This is the architecture for me, and many other things ... "
He lives and works in Rome and Paris. Among the major awards include: "Légion d 'Honneur" by the President of the French Republic (2010); Cavaliere di Gran Croce della Repubblica Italiana (2006); member of several academies as: RIBA - Royal Institute of British Architects - London, UK; Académie d'Architecture in Paris, France; International Academy of Architecture in Sofia, Bulgaria; AIA Architects- -American Institute of Washington DC, USA. He has also won numerous awards including: "LEED EB: O & M" to the New Fiera Milano, the first European trade fair sustainable, Milan, Italy; "Architizer A + Award" and "A + Architizer Popular Choice Award", Shenzhen Bao'an International Airport - T3, Shenzhen, China awarded in the category "Transportation - Airports", New York, USA; "Idea-Tops Awards", Shenzhen Bao'an International Airport - T3, Shenzhen, China awarded the "Best Transportation Space", Shenzhen, China; "Medal of the Presidency of the Council of Ministers", Italy; "International Architecture Awards 2007," New Fiera Rho-Pero, Milan, Italy awarded "Best New Global Design", Chicago, USA; "Grand Prix National d'Architecture Française", Paris, France; Lifetime Achievement Award “Vitruvio International a la Trayectoria”, Buenos Aires, Argentina.